As you line up the cabin with fuselage you can see how good your measurements were for the cabin and the fuselage and in particular how square is the first frame of the fuselage. Place supports under the front on the cabin structure until the two sections are square. TIP: Brace the fuselage and the cabin along the workbench centre line so they don't move. Also, you may have to pop one or more ribs joining the first and second frame to allow the edge to become flush with the cabin frame. With the fuselage and the cabin square to each other and fixed along the centre line, drill the holes for the floates and bolt the fuselage to the cabin structure. Mark and drill the holes for the rivets in frame and the cabin structure inserting clecos as you go. Check regularly to make sure both sections remain along the centre line of the workbench. After notching the cabin floor pan so it will bend against the fuselage comes the fun part, lying on your back setting out, drilling and holding together with clecos. The fuselage however will have to be off the workbench and supported so you can climb under the fuselage to do this next stask. The section to take the floate bracket will also have to be cut so it can be used to bolt the fuselage to the cabin structure before any drilling takes place. 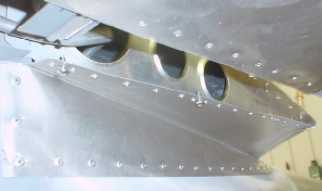 Start from the centre line underneath the fuselage and work your way out toward the edges insering clecos as you drill the holes. Once all the holes have been drilled remove all the clecos and prepare for the final assembly and riveting. TIP: When joining the two sections together for the last time, start with all bolts then the clecos from the centre outwards always checking to make sure the cabin and the fuselage remain along the centre line of the workbench. With the two sections now riveted together, the top of the cabin can now be joined to the fuselage. After the four brackets have been riveted into place the skin can be marked, drilled and hold into place while the end sections are fitted. TIP: Use a section of angle to clamp the end brackets into position while marking out and fitting, however don't rivet the skin into its final position until the wings and controls have been fitted and tested. 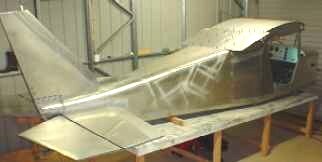 With the controls in place and the ski brackets and pullies bolted back into position, the 0.025" side skins can now be riveted into position fully enclosing the fuselage and making the project more like an aircraft as each section is completed. After the skins have been riveted into position, the landing gear brackets can be bolted to the cabin floor pan again ready for the wheel frames to be assembled and its removal from the workbench for the last time as it will stand on its own wheels. 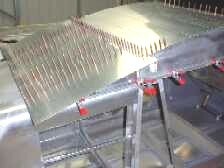 With the aileron controls cables tested and secured with safety wire, the fuel lines can be run and the skin used to close in the gap can be riveted into position. The fuel line is in position ready for connecting to the tank. TIP: Rather than bend the top skin back on itself, bend and cut a 15mm fold so it secures the bottom skin and you won't need any rivets. 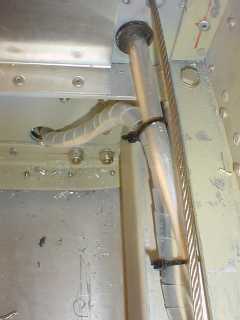 This image shows the aluminum fuel line on the left side of the cabin entering the cabin through a rubber bush under the rudder control cable. The fuel line then passes through the holes at the end of the cabin support frame making it's way to the fuel selector that will be located under the pilots seat. The same process is followed to bring the right fuel tank line to join up to the fuel selector. I have also run the electrical cables and covered them with twist wrap for protection. There is plenty of room for both the fuel line and the electrical cables and provides adequate protection from objects placed on the cabin floor behind the seats.